If you�ve seen this movie at any time on a Sunday afternoon and you enjoyed it, then by all means you must have a look at it on DVD. The film transfer is absolutely fantastic. It�s well worth checking out the extras first to see how much extra work has gone into remastering some pretty ordinary quality footage to a perfectly watchable film. The story follows a newly famous scientist/ explorer who has recently been knighted. Upon being knighted he receives presents from his loyal students at the university. Among the gifts a young man, his prize student gives the professor a paperweight made of lava, suspicious of the gift and its unusual weight for its size, the professor becomes late for his celebration dinner. When he is found in the university trying to melt the lava off the object that the professor is convinced is inside, the servant blows the kiln apart revealing a plum bob. This particular plum bob is that of the property of a Famous Explorer who had mad ravings of a tunnel that leads to the center of the Earth. Wow, what a discovery (in an English accent) the famed man who had gone missing years ago had only been met with scrutiny and jokes for his theories on a tunnel to the center of the Earth. When the explorer�s plum bob was found coming from a volcano on the other side of the world such a lead must be followed. So the intuitive explorer sends his findings away to be verified before he goes away on the lengthy trip, surprised to find his discovery was being ripped off by the very man that would confirm the authenticity of his claims. 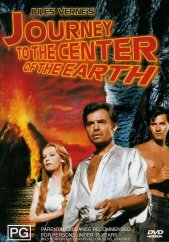 With an in depth story of what it may be like in the center of the Earth this is a great movie. With tremendous winds, huge deserts and the underground sea it shows the writer�s depiction really well. Though the movie is quite old, the film to digital transfer is very good if you check out the DVD extras you can see what they had to work with. Of course no explorer movie can be complete without an evil guy to bug it up for everyone else in the party. Without a doubt this is one of the best classic exploration titles ever, right up there with 20,000 leagues under the sea. Great quality sound and picture quality, though not a whole lot of extras just the recreation of the film to digital and the original trailer.